These final decades spent on the western rivers seem to be a peaceful period for Dr Cotter. The drinking was probably a fact of life for him in his final years and there are several references to him owning public houses. The State Library of NSW holds a deposition Research 10-1 in which Dr Barry Cotter is charged with operating a disorderly house at Menindee. He was committed for trial at Wentworth on 8th January 1873, but no further details are available. Dr Cotter died in Swan Hill on November 1st, 1877. Some sources say that he was taken ill while working in Balranald and taken to hospital in Swan Hill, others that he had retired to Swan Hill and was admitted to the hospital there. His death certificate Research 10-2 says that he died of chronic diarrhoea and senility and that he had had the condition for seven months. He is buried in an unmarked grave in Swan Hill cemetery. His death certificate records that there were three witnesses present at his burial – Mary Ann Burns, James Lynch and Joseph Smith – but that there was no minister. 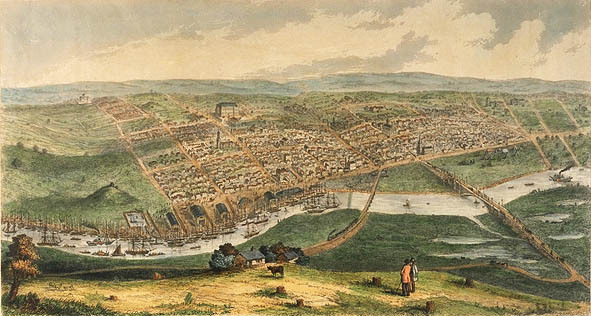 Sixty years later when Melbourne celebrated its Centenary there was much written about the pioneers of the early settlement on the Yarra and Dr Barry Cotter was recognised as Melbourne’s first doctor. 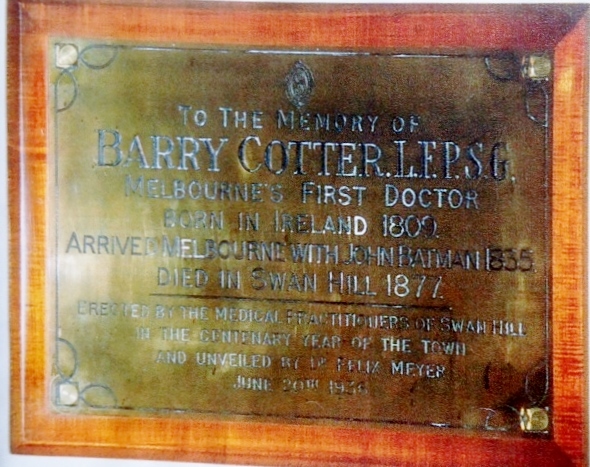 In order to link Swan Hill with the Melbourne Centenary celebrations the medical practitioners of Swan Hill installed a plaque in memory of Dr Barry Cotter in the Swan Hill Town Hall. This was later moved to the Swan Hill Hospital, where it remains today and recognises his work in both early Melbourne and his final years in the Swan Hill district. Inez died on 7th February 1864 at 92 Rowena Parade, Richmond, Melbourne. Her death record says she died of epilepsy aged forty. In those days epilepsy was closely associated with mental illness. Her husband, James Hobbs was the informant and it was noted on her death certificate that her former husband is still living in the colony. A notice which appeared in the Argus two days after her death names her as Mrs Barry Cotter and she is buried in Melbourne Cemetery, not as Inez Seville Hobbs (or Vignoles or Fitzgerald) but as Mrs Barry Cotter. Perhaps she understood that her best chance of being remembered was a the spouse of the first doctor in Melbourne. Francis Durell Vignoles became a successful grazier in Queensland and remained single until 1864 when he married Elizabeth Dunne, a widow with four children. In her book ‘The Evil to Come‘, Kathleen Clarke theorises that there had been a relationship for some years between Elizabeth and Francis, as they both came from the same village in Ireland. More information here. Francis died on 6th June 1893, aged seventy-six and is buried at the Cecil Plains Homestead Cemetery, west of Toowoomba, Queensland in an unmarked grave. In 1998 the Cecil Plains Local History Society erected a memorial to those with unmarked graves, consisting of wooden planks with names and details inscribed. 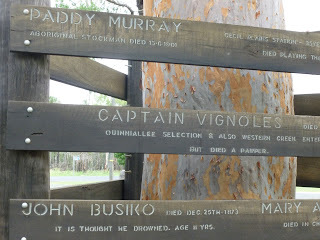 The full text of Francis Durell Vignoles inscription reads “CAPTAIN VIGNOLES died 6.6.1893. Aged 76 years. Quinniallee Selection also Western Creek. Entertained lavishly but died a pauper. ” (Clarke K, e p 169). An interesting comment, and no doubt one that members of the Vignoles family might wish to investigate. Kathleen Clarke uses this quote and picture as the final page in her book. And so ends the story of these people whose lives, although far removed from ours today, are the cause of us being here. It is easy to trace our link to them through Charles Henri Cotter who married Hughena Daly at Holbrook (then Germantown) in southern NSW. They were both teachers and spent their lives in small towns in rural NSW, including Wagga Wagga in 1882 when their firstborn Leslie Frank Barry Cotter (my grandfather), was born. As mentioned in the introduction my grandfather inserted the hyphen which made the surname so distinct and ensured that the story of Dr Barry Cotter would survive. If you would like to add your family tree to this website to show your family connection to Dr Barry Cotter or if you have any comments, questions or clarifications on any part of this story I would love to hear from you. Please use the contact form below and I’ll get back to you as soon as possible.